Bugging out should not be plan A. It should be the absolute last option that you have because trying to survive while bugging out will probably be the most challenging event you would ever have to face. This is why I encourage preppers to develop a strategic plan where they would never have to bug out. That way you won’t have to worry about what to put in a bug out bag. However, if SHTF bugging in may not be a viable option. This is true if you live in a high crime, dangerous area with low amount of resources. If you haven’t been able to develop a strategic plan then you would probably be forced to bug out. One of the most important tools for bugging out would of course be the bug out bag. I’ve mentioned in a previous post some of the most important features to have in a bug out bag. There is also a review of the Condor 3 Day Assault Pack which I would highly recommend for a bug out bag. 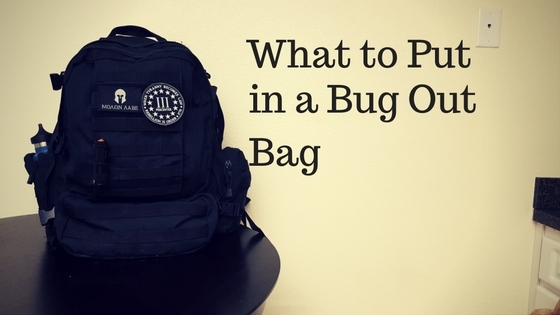 In this post I will be sharing some suggestions and tips on what to put in a bug out bag. The bug out bag is meant to help you survive until you are able to reach your bug out location. What to put in a bug out bag is not meant to ensure that you will survive the end of world with that alone. Your necessities to survive when SHTF should already be stored at your bug out location. Considering what to put in a bug out bag is dependent upon the most likely circumstances that you will face. For example, if you live up north what to put in a bug out bag should include gear to keep you warm. However, if you live somewhere like Florida you won’t have to worry about surviving cold weather on a bug out. Other factors include the potential threats that you may face on your bug out. This could include violent people or even animals in the wild like beasts. You will also need to factor in your travel distance. You will want to pack gear and supplies to help you survive up the 72 hours. If you have strategically planned correctly then it will not take you any longer to make your destination. When it comes to survival you have remember the rule of 3’s and use that as a foundation to build on. The rule of 3’s state that you can only survive 3 seconds without hope, 3 hours in rough weather conditions, 3 days without water and 3 weeks without food. So for starters you will want to have some gear to help you build a shelter. You could make a lean-to shelter with branches and other resources. You could also pack a tarp like the Snugpak Stasha Shelter that you could pitch using paracord. This shelter will keep you safe from the elements and give you the ability to absorb heat from a fire that you may build. Speaking of fire you will want to pack gear to help you build a fire. Of course you should practice making a bow drill to make a fire along with other DIY fire starters that you can create. That way if you lose your gear you are still able to make a fire. Otherwise you can pack a knife to cut branches. Survival knives like the Schrade SCHF9 has a striker so that you spark a fire. Having a Ferro Rod is another option. Packing a first aid kit is a no-brainer. You won’t be able to survive long if you have severe bleeding. A Shemagh is a great piece of cloth that you could use for a bandage or tourniquet. As a matter of fact the Shemagh has so many great survival uses that you can check HERE. You can only survive 3 days without water. Now this doesn’t necessarily mean that you should pack 3 days’ worth of water. If you are able to make your location under 3 days then maybe you only need a couple of bottles of water. You may get really thirsty but you will survive. Now I’ve mentioned in a previous post about bugging out in hotter weather you will need a lot more because you will be battling dehydration a lot faster. So having a great flask along with other refillable options such as the LifeStraw water filters would be imperative. This would help you collect water along your bug out until you reach your location. Be sure that you have one bottle for collecting water and another for drinking. Do not drink water from the same bottle that you are collecting with. That way if there is bacteria in the water you can collect it, filter, and purify it. Then pour it in a drinking container. Afterwards you can reuse the other container to collect more water. There are some really great ways to filter water. You can buy water filters or make your own DIY filter using a Shemagh. Just because you have filtered the water doesn’t mean that it is safe to drink. So be sure to also purify the water. You can use your fire to boil the water which will remove the harmful bacteria. Otherwise you can use purification tablets if you don’t want to build a fire. You can only survive 3 weeks without food. As I mentioned previously your bug out should be no longer than 3 days. So technically you can survive that long without eating. However, I would recommend packing some snacks and other foods that will give you energy. Walking is going to drain you. If you don’t want to build a fire then you could pack some beef jerky or protein bars. Otherwise you could pick up some Mountain House dehydrated food that you could boil using heat from a fire. MREs (meals ready to eat) are another option that people consider as well. However, the taste is not really something to write home to mom about. Having a map would be really helpful to help you navigate to your bug out location. You may think that you know your area like the back of your hand. But believe me, driving around an area is nothing compared to walking around it. It opens up another world. You may need to take detours to avoid visible danger. So having a map will be extremely important. Having a form of communication for you and your family or survival group will be extremely helpful. HAM radios will be the best way to communicate with a group of people. You can connect to a local repeater that is only accessible with a code ensuring privacy. HAM radios like the Baofeng UV-5R will probably be best for this type of scenario since you are able to communicate at greater distances compared to other radios such as the GRMS radios. In a previous post I mentioned how to use the Baofeng UV-5R. You can use that as a starters guide. Using self-defense will be inevitable during a bug out situation. Therefore you will need to have some sort of self-defense training. Of course you need to have a concealed carry weapon. Now some preppers may encourage you to have your AR15 in a sling. However, I encourage you to be the grey man in this type of situation. You don’t want to draw a lot of attention to yourself while bugging out. Flashlights will also be very important in a SHTF scenario. If the grid is down you will want to be able to see where you are traveling. It is also helpful in a self-defense situation. If an attacker is coming at you then you may have time to temporarily blind the person to give you time to access your weapon or de-escalate the situation. Previously I mentioned packing a tarp to pitch a shelter with. In that shelter you could use a pile of leaves to lay on for cushion. Another option is to pack a sleeping pad and bag. However, this will take up more space in your bag and add weight. You want to keep your bag weight as light as possible so that you move quickly. Also the weight of that bag will start to weigh you down (literally) the further that you walk. When SHTF you may have to grab sharp or unknown objects. Having some padded gloves will give you some protection. It will also give you the ability to grip items easier. You may need to fix items while you are bugging out. However, you don’t want to be packing an entire tool box with you. Instead you can carry a multi-tool. You will be amazed how useful a multi-tool can be when you really need it. Finally one last comfort item that may be helpful when you are bugging out would be a portable power source. This would be helpful to keep your cellphones charged along with any other useful electronics. There are a few uses of old cellphones that you could use when bugging out. This will also give you some more comfort during such a stressful situation. You will want something to boost your morale to keep you going. For a more thorough list of what to put in a bug out bag I recommend that you download the ultimate prepper’s checklist. It not only includes gear for bug out bags but also for tons more. These are only a few of my suggestion on what to put in a bug out bag. What other gear and supplies would you recommend? The feedback that you provide helps the prepper community prepare the smart way so that we can thrive later.